A People's Climate March organizer reflects on the march's successes and missed opportunities, and sees a movement on the verge of a new beginning. The 400,000 people who packed Manhattan’s Central Park West for the People’s Climate March on September 21 have all gone home to their apartments, farms, cabins and lobster boats. They’ve returned to Pine Ridge Indian Reservation and the Wet’suwet’en territory in British Columbia, to the Philippines and the Pacific Islands. The “U.N. Climate Summit” banner that, last week, formed the backdrop for the impassioned speeches of 120 heads of state — and Leonardo DiCaprio — has been taken down. Debate in the newly renovated General Assembly Hall has turned to terrorism — a different kind of security threat than that posed by drought and rising sea levels. The metal barricades erected against protesters who flooded the heart of global capitalism at last Monday’s Flood Wall Street demonstration have been cautiously removed by the New York Police Department. Frostpaw the polar bear has gone to jail. While it might seem like another toothless remark from the president, it at the very least shows that the commotion two days earlier penetrated the inner sanctums of power. The march was particularly a success, Aroneanu noted, in that it broke down color barriers for an environmental movement that for the past several decades has been highly segregated between white and wealthy and low-income racial minorities. The climate march, more than any other mass mobilization before it, reflected the faces of those who bear the brunt of climate change. 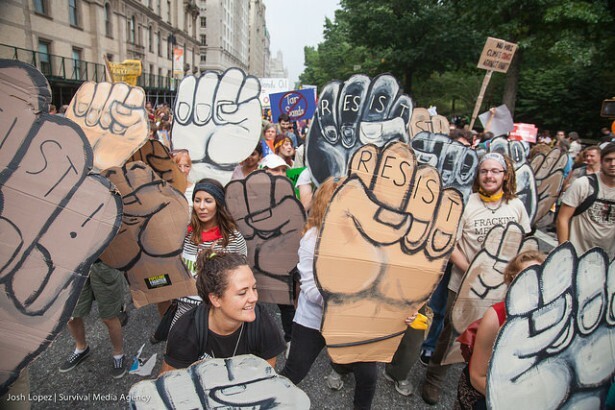 “Communities of color and indigenous groups — from hurricane stricken areas in the Gulf Coast through the Atlantic seaboard, to black farmers in middle America, to indigenous lands being mined for coal, and beyond — came together in New York for the People’s Climate March,” said Jacqui Patterson with the NAACP’s Environmental and Climate Justice Program. You will find detractors few and far between those who participated in events in the streets last week, including myself. I sat on the coordinating body for the march early on, helped organize more than a hundred teach-ins and skill-shares ahead of the mobilization, and played a role planning Flood Wall Street. Yet, up until the day of the climate march, it was unclear whether it would be a drop in the bucket or a splash in the face of apathetic world leaders. Before the coalition that formed in response to the U.N. Climate Summit had even decided on whether there would be a march — or whether we would hold a rally instead, or even a simple conference — the grouping that eventually became known as the People’s Climate March Host Committee agreed to put people living on the front-lines of climate change at the center of our organizing efforts. They also agreed to follow the Jamez Principles of Democratic Organizing — a central tenant of which included an emphasis on a “bottom-up” approach. 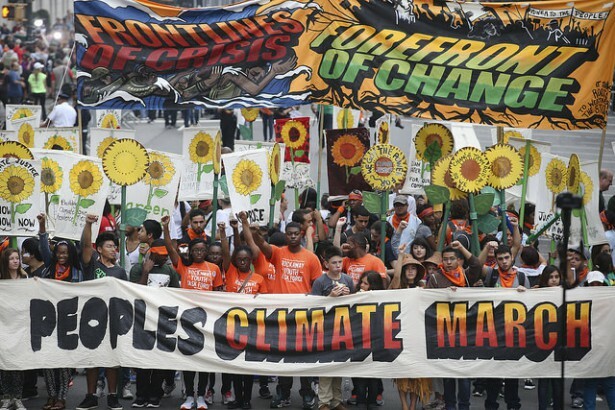 This entailed black, Latino, and indigenous peoples forming not only the head of what would become the People’s Climate March, but also having a dominant say in the decision-making process from the beginning. However, opposing organizing models and a discrepancy in funding and resources between both grassroots and environmental justice groups and the larger NGOs made this process rocky. Eventually, the Host Committee’s work became solely focused on outreach. Political debates surrounding messaging and the content of the march were out and conversations in our weekly meetings centered on coordinating flier distribution and planning pep rallies ahead of the big day. A separate committee formed, composed of staffers from well-established NGOs and paid community organizers. Its composition remained opaque to those, including myself, who had sat on what was the original leadership body. Far from recruiting the working, poor and diverse communities of color that compose the bulk of the Metropolitan Transit Authority’s riders to join the march, the slogans appeared to trivialize the mobilization and to be geared towards recruiting a wealthy, privileged base. Because they were by far the most visible of all the propaganda generated ahead of the march, comprising approximately 10 percent of the MTA ad space, they had the further effect of nullifying the discussions around messaging that had taken place on the Host Committee before it became solely an outreach vehicle. While we were not able as a committee to agree on a singular set of demands, I felt these conversations were an important part of the process in terms of how the march was framed. Ian Keigh, a campaign director with Avaaz, explained the organization’s thinking behind the ads to me, saying, “Bankers and hipsters, are the first two demographics that spring to mind when people think of New York.” Since climate change effects everyone, the posters were an effort to show that the march would also include everyone. “We wanted to make it feel like you can have a normal day and then you can change history,” Keigh added. It is important to note that, aside from a small “Carbon-Free Capitalism” contingent organized by green investment firms, very few bankers actually participated in the march — nor did Avaaz take corporate money, as many believed the ads indicated. Avaaz is entirely crowd-funded and does not accept donations of more than $5,000. The ads were indicative, however, of the dominant liberal ideology that characterized the march organizing and indeed pervades the U.S. political climate as a whole. It may sound incredible, but despite environmental justice groups — primarily those in the Climate Justice Alliance — playing a large part in the organizing process, class and racial analysis were largely avoided within the broader organizing drive. The general effect was one of de-politicization in favor of creating a big tent. 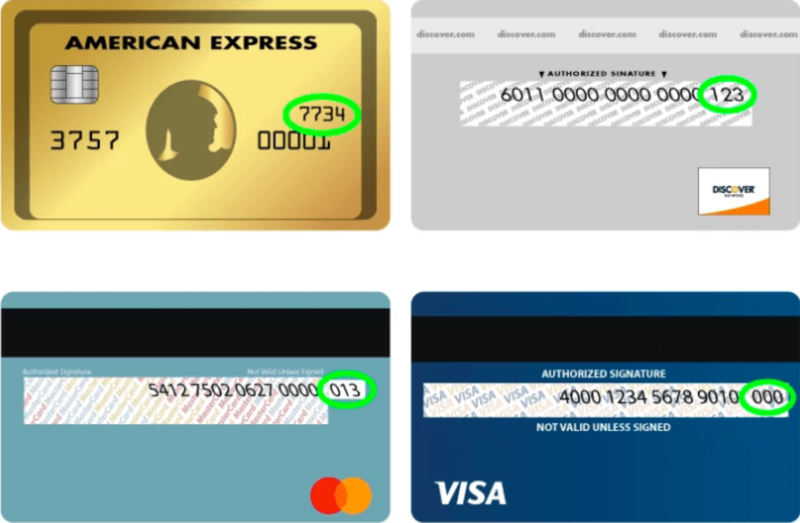 An art project designed by the activist network Beautiful Trouble optimized the situation. Participants were encouraged to write down on strands of ribbon their personal reasons for joining the climate march. The ribbons – thousands of them – were collected, tied together and hung from the branches of a giant tree built by the artist Swoon. The tree greeted march participants at the end of their journey through Manhattan, and the messages it generated were indeed beautiful. However, at the risk of offending some of my friends who worked hard on this project and on the march itself, I don’t see the point of demonstrating unity when there is no clear, cohesive purpose other than to raise awareness or show we care. The issue of demands is particularly pertinent given that U.N. climate negotiations have been riddled with flowery language, vague unkept promises and disingenuous solutions. The 2020 emissions reduction target set by the Obama administration ahead of the 2009 Copenhagen climate conference serves as a telling example. While Obama pledged to cut emissions 17 percent below 2005 levels, that is only a 4 percent reduction compared to greenhouse levels in 1990, which the Kyoto Protocol used as a bar. Under the protocol, which the United States backed out of in 2001, the goal was a 7 percent reduction from 1990 levels by 2012. Obama claimed that he came to Copenhagen to help “shape the future that we seek,” but the leader of the most powerful nation in the world actually made the shape of things to come a whole lot hairier. 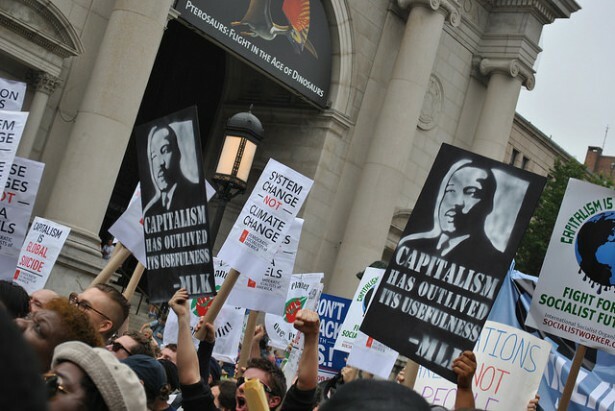 A growing anti-capitalist strand of the climate movement was successful in using the march and the buzz around it as a springboard to ask for more — for the entire planet back, in fact. Best-selling author Naomi Klein’s new book “This Changes Everything: Capitalism vs. the Climate” was released in September — timed to coincide with the march. 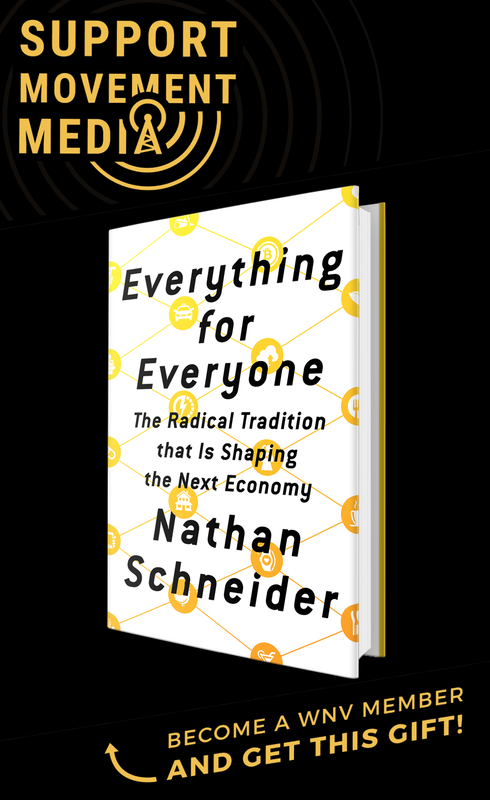 It sharply articulates a brewing discontent and lack of faith in our current socio-economic system’s ability to manage the climate crisis. “If we had acted in 1988 or 1990 or 1992 it is possible there could have been a reformist path to get off of fossil fuels,” said Klein, who spoke at a packed St. Peter’s Church on the eve of the march, as part of a series of events members of SCNCC helped organize. “But we didn’t. Our emissions are up 61 percent.” Drawing on scientific research, Klein argued that if “we want to avoid catastrophic warming, we now have to reduce our emissions in the Global North by between 8 and 10 percent a year” — a fact that’s incompatible with the logic of perpetual growth inherent in our competitive, profit-based, global economic system. While the march’s call for “a world safe from the ravages of climate change” was broad enough for the Climate Group — a non-profit funded by Duke Energy, News Corporation and Goldman Sachs among others — to endorse, the Flood Wall Street protest carried Klein’s message to the barricades, taking aim directly at the likes of Goldman Sachs and other investment firms and commercial banks that fund fossil fuel extraction. Rather than framing their action in opposition to the march, Flood Wall Street organizers formed a contingent in the parade of bodies that poured past Columbus Circle on on the day of the march, using it as an opportunity to promote their politics and to recruit participants for the direct action on Wall Street the following day. Social media statistics reflect the success of this tactic. #PeoplesClimate, the hashtag for the march, generated 334,820 original tweets according to statistics provided to me by Mark Provost of U.S. Uncut. Although the number of participants in the anti-capitalist direct action on Monday was fewer by a factor of ten, Flood Wall Street generated 154,138 original tweets, about half as many as the march it used as a springboard. The fact that the Flood Wall Street’s march started at 9 a.m. on a Monday — a time when most people are arriving at work — certainly reduced the number of participants, but Twitter highlights the pervasiveness of the sentiment they conveyed. Flood Wall Street expressed a systemic analysis along with the ecstatic, angry and creative energy shared by many of the ground level staff and volunteers who canvased, made phone calls, and painted banners for the People’s Climate March, and who felt stifled and left out of the decision making process by the large the NGOs. Two thousand people sat down around the famous statue of the bull near Wall Street and to everyone’s surprise, no initial arrests were made. We were allowed to stay put for several hours, paralyzing vehicular and foot traffic in the Financial District for much of the day. 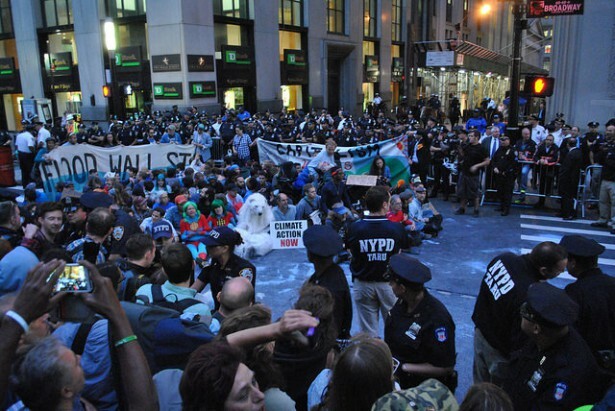 The reasons for the hands-off approach of the police are many fold, and are in part due to Mayor Bill de Blasio not wanting the violent stigma that clung to his predecessor over his repressive dealings with Occupy Wall Street. It didn’t hurt either that there were simply too many people taking part for the NYPD to apprehend everyone. To many activists here in New York, these remarks signal a moment to go on the offensive — a chance to be more daring with less risk of reprisal. Yet, the question of how best to escalate the struggle for a just and sustainable planet is not just for those looking back on Flood Wall Street and the People’s Climate March, but one that confronts all of us moving forward. It is a task that, after this watershed moment, participants have carried back to the boroughs, cities and towns from which they came. Climate change presents the human race with the possibility of extinction, of reaching a bitter end, but from what I witnessed on the streets of New York, we are on the verge of a new beginning. The only future we will have will be the one that we have demanded. And the only possible world left for our children, is the one that we will have wrestled from the hands of those who are poisoning the present. @ “If we are to believe 98 percent of the world’s scientists, the future of human subsistence on this planet hinges on the strength of the pacts world governments will forge.” If the People’s Climate March is to accomplish anything worthwhile, and do more good than harm, folks had better stop relying on world governments to carry their water. Governments are the problem; now way can they be the solution. @ “…we succeeded in using large numbers of people to display our collective power over the state. This was extremely empowering.” The problem with governments is that they have power and authority because people believe they have power and authority, but their authority is illegitimate. Since no individual has authority to control his neighbor by force, it is impossible to delegate such authority to government. I don’t accord power and authority to the state or anyone else to control (enslave) me, and I certainly wouldn’t trust the People’s Climate March people with such power any more than I trust government. If you want to stop global warming, stop contributing to it and stop asking the state, like a nanny, to do it for you. Grow up and become responsible.